The Pacific Coast League announced today its 2013 All-Star team, comprised of players from each of the 16 PCL clubs. 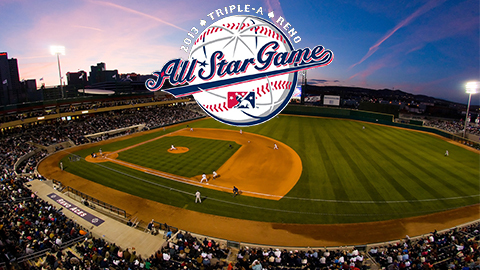 The PCL All-Stars will take on their International League counterparts in the Dolan Auto Group Triple-A All-Star Game, set for Wednesday, July 17th, at Aces Ballpark in downtown Reno, Nevada. The 26th annual matchup will be broadcast live on MLB Network, the American Forces Network, and the Triple-A All-Star Game Radio Network. Brett Butler of the Reno Aces will skipper the PCL All-Star club, which features 30 of the top hitters and pitchers in Minor League Baseball. Thirteen players were elected to the squad by the balloting of the club's field managers and general managers, members of the media, and online fan voting, while 17 were selected by the Pacific Coast League office. The PCL starting infield will include Memphis Redbirds first baseman Brock Peterson, who has hit a league-leading 19 home runs on the season, second baseman Wilmer Flores of the Las Vegas 51s, the PCL's RBI leader with 63, and Reno Aces' teammates Chris Owings and Matt Davidson will man the shortstop and third base positions respectively. Owings leads the league in hits (130) and runs scored (69), while Davidson has a team-leading 22 doubles. The starting outfield consists of Sacramento River Cats' Michael Choice, who has 11 home runs and 53 RBI, Joey Butler of the Round Rock Express, who returns to the All-Star Game for the second year in a row, and Nick "Chili" Buss of the Albuquerque Isotopes, who has 13 RBI in his last 10 games. Sacramento's Sonny Gray will be the PCL starting pitcher, making him the second consecutive River Cat (Graham Godfrey/2012) to get the nod. The right-hander is 7-5 with a 3.02 ERA and leads the league with 98 strikeouts. Also starting will be catcher Rene Rivera of the Tucson Padres and designated hitter Brett Pill of the Fresno Grizzlies. Rounding out the elected players are relief pitchers Chris Hatcher of the New Orleans Zephyrs and Rob Wooten of the Nashville Sounds, and Oklahoma City RedHawks starting pitcher Jared Cosart. The selected reserve players include third baseman Yangervis Solarte, starting pitcher Brad Mills, and relief pitcher Cory Burns, all representing Round Rock, catcher Johnny Monell and outfielder Roger Kieschnick of Fresno, outfielder Carlos Peguero and relief pitcher Brian Moran of the Tacoma Rainiers, and infielder Dean Anna and relief pitcher Colt Hynes of Tucson. The remaining selections are starting pitchers Chris Rusin of the Iowa Cubs and Michael Wacha of Memphis, infielders Grant Green of Sacramento and Ryan Wheeler of Colorado Springs, relief pitchers Louis Coleman of the Omaha Storm Chasers and Jason Stoffel of Oklahoma City, infielder Efren Navarro of the Salt Lake Bees, and catcher Tuffy Gosewisch of Reno. With the Pacific Coast League's 3-0 victory at last year's Triple-A All-Star Game in Buffalo, the PCL has closed the gap on the International League's lead to 8-7 in the fifteen years since the event changed to the current IL vs. PCL format. The winning League this season will once again earn the right to have its champion play as the "home team" at the Gildan Triple-A National Championship Game which will take place Tuesday, September 17 in Allentown, Pennsylvania, home of the Lehigh Valley IronPigs.